She takes her hand wondering what was going on but didn't really care. 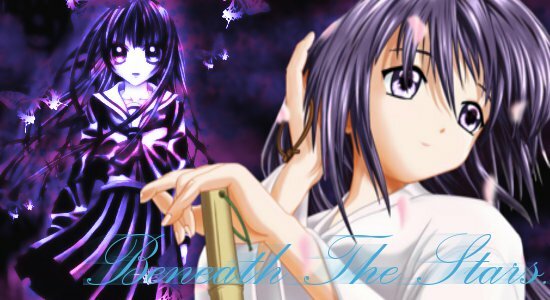 Shino's eyes slowly fill to a light purple and the ground slwoly fades itno the moon. "Whoa, what's going on here?" "its just the moon akime, ntohing to be worried about." "you wont fall you know akime.." she said lightly, letting go of her hand. "Are you sure? We are on the moon for petes sake!" "yes im sure!" she exclaimed, giggling a bit at her reaction. "Okay." she said easing up a whole lot. She nods and sits down. "so whatcha wanna talk about?" "I don't know. What do you want to talk about?" "what do you think about him? she asked msiling still. "He seems nice, cute, needs emotions though, why?" She giggles nad laughs lightly. "oh just wodnering!" she said. "i dont think he's that cute though." she said putting on a fake frown. She giggles softly and pokes her forehead. "you panicing akime~sempiea i knew you like haseo!" "your not a good faker akime.." she said sticking out her tongue at her. "I'm not pretending!" she yells loudly, "And why would you think I like him. It's strange when you're the one that really does." she said sticking her tounge out at her. "i have no feelings for Haseo akime, you do i can tell!" she said giggling happily to herself. "Okay, you say you don't like him then why did you smile when you said his name?" "because im like haseo's sister thats why!" she exclaimed, a light blush or ink across her cheeks.